Centrally located near all Coachella Valley music and film festivals, Palm Springs shopping and the local Restaurant District, not only do our guests love our property's close proximity to area attractions they also praise our complimentary daily breakfast, free WiFi, comfortable oversized suites and refreshing onsite pool. Plus, our convenient, furnished meeting room and BBQ patio are big hits for guests and locals hosting special events. Check out our satisfied guests' reviews today. My stay at Indio Super 8 was great! 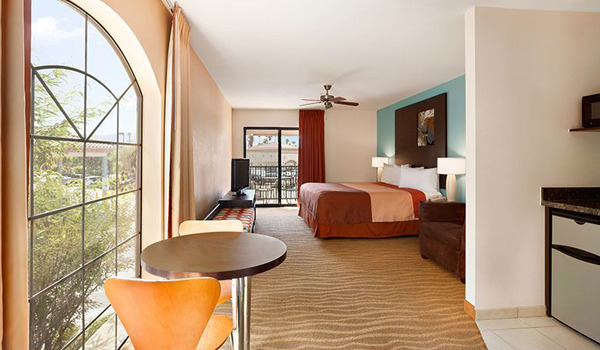 The room is very clean and the daily housekeeping service is awesome as well. Room is spacious. Furniture is simple but it is good. Pool is nice. Front desk was very friendly; Ashley was a peach! She was very kind and courteous; great gal! Gave me a couple of suggestions for dinner and took one: Sloan's is amazing! Thanks Ashley you are great! I spent 3 days here while we were in Indio for a wedding. When I arrived i asked the front desk lady Jessica to see if she could give my family and friends rooms right next to one another. I was very thankful she was able to accommodate this request. Even though she seemed busy she took her time and was able to help us all out. Jessica also gave us some recommendations for good places to eat nearby. She reflected excellent customer service even while my family was exhausted and hungry from driving from Bakersfield. Also I want to share that the AC kept us cold inside because summer heat in Indio is no joke. So I highly recommend this place for great customer service at the front desk, clean rooms and good location. I spent 4 nights at this hotel while is was in town for work. The location was ideal (I was working at JFK Memorial Hospital) it is so close to a movie theater and some good food options. But aside from that the staff is very accommodating. My flight was delayed and was going to arrive somewhat later than check-in time so I called to let them know. Upon arrival I was greeted by Jessica - she was kind and was able to give me a room on the second floor. Because I was spending a few days I asked her about the area and some good food options She was very knowledgeable of the area. She gave me options to dine at Chinese, Mexican and Japanese restaurants and some fast food and movie theater you can walk to from hotel! She was like the hotels concierge, definitely knows the area and good restaurants. The room was clean, and the AC kept my room cold. I would definitely stay here again when I am back in Indio for work. The rooms are amazing and clean. The beds are comfortable, the AC was excellent, there was many TV options, etc. The service from Jessica was awesome because she was friendly, knowledgeable and patient. I will definitely come back in the future. This place is really nice considering the fact that I work for the federal government and have to travel a lot I have been coming through this place for about 4 1/2 years the staff here are amazing Jessica and Christina are always so very helpful they always go above and beyond what is called for always have great attitudes very pleasant to do business with the property is taken care of any issues that have occurred or dealt with swiftly I have absolutely no complaints with this property and the staff thank you guys. I have stayed here once before and the great service never fails! Ashley checked me in and she was outstanding! She helped me find my way around town and gave me some great recommendations for dinner; Pueblo Viejo. When I came back from dinner my T.V. was not working and Ashley personally went up to my room and fixed my T.V. ; talk about great customer service! Bed was comfy,room was very clean and AC was really cold. Next time I'm in town I won't hesitate to stay here. I'm always on the road and it was my first time staying here and I must say if I'm ever back in the Coachella valley I'll be staying here again. The ac in room was great when I walked in, showered in a clean bathtub and fell asleep las soon as I layed on the bed. TheGirl at service desk was sweet, and recommended good Mexican food. Checking in with Jessica was a smooth and easy process. We couldn't figure out why the lights weren't operating properly but Jessica got us a maintenance call right away and made sure the room was perfect for our stay. Very friendly and helped us feel comfortable during our stay. From the time we showed up we were treated great. The staff was helpful with all our needs. We showed up early for our reservation and they were very accommodating. We were able to enjoy the pool and relax while we waited. The bbq area is a great place to cook lunch next to the pool and the amenities were clean and ready. 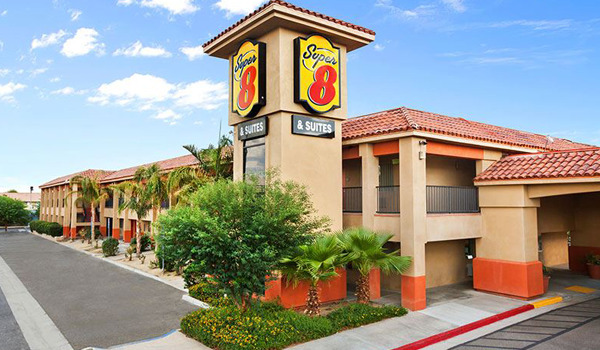 I will be back at the Super 8 Indio next year for the festivals!!! I have to say from my arrival to my departure it was like home away from home the staff were amazing and the breakfast was a plus the fresh waffles my kids both loved them ! And the grounds were so well kept the bed was so comfortable :) I also really appreciate how the front desk would call to see if I needed anything they truly know the meaning of customer services will definitely come back and let my family and friends know what a grate place this is thank you super 8 for making my get away a memberal one. Front desk people were terrific. Excellent experience. Super nice staff and really nice rooms! Good: Staff and management made sure the volunteers for California Care Force were fed and had coffee at 5;30 am befoe we headed out to volunteer. Thank you! Bad: My TV didn't work. Very courteous and polite staff who go that extra mile to make sure you the guest are taken care of. Ashley was very polite and so very helpful. Do yourself a favor and ask for Ashley. Good: Staff was very polite. Hotel was very quiet. Plus it was right in the middle of town. Good: Bed & pillows cumfie! Upgraded free of charge was unexpected pleasant surprise. Had a little private patio with table & chairs. Suite had a comfortable sofa hideabed, one burner stove, coffee pot, sink, small refrigerator freezer, 2 skillets but no utensils or cleaning products for them. Overall, very nice, pretty quiet. Bad: Floors could've been a little cleaner. Good: It was comfortable, clean, quiet, and the parking was good. They have resolved their hot water issue and now there's plenty of hot water. The staff was super friendly. Bad: I like to sit on the balcony and drink my coffee in the morning. We were only given enough coffe for one small cup, one creamer etc and they never replenished it each day. They have coffee in the lobby but you have to drink it in lobby and you can't use your own cup. If you like coffee in the comfort of your room you might want to bring your own pot and supplies. The breakfast was extremely limited and you can only eat it in the lobby. Very nice hotel. Good comfort. I like the nice comfort in the room. Pretty quality and clean area. I will love to comeback.